We all have our favorite places in Singapore. It could be the Marina Bay Sands, Universal Studios, the Merlion Park, the whole Sentosa Island, Orchard, Clark Quey, Bugis shopping district or Chinatown. For me, my favorite is just one tree and one store- all so colorful I can just go back to Singapore and sit under that tree and eat inside that store all day. 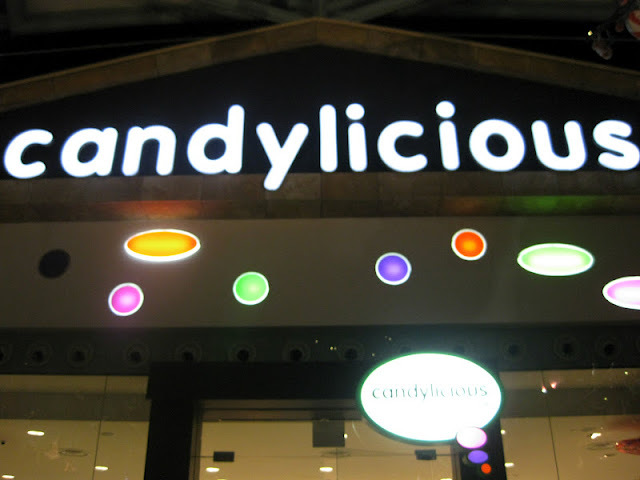 The wonderful place I am talking about is so aptly called- CANDYLICIOUS! Nothing in the world would best describe the most colorful store I've seen in my entire life than those 12 letters. 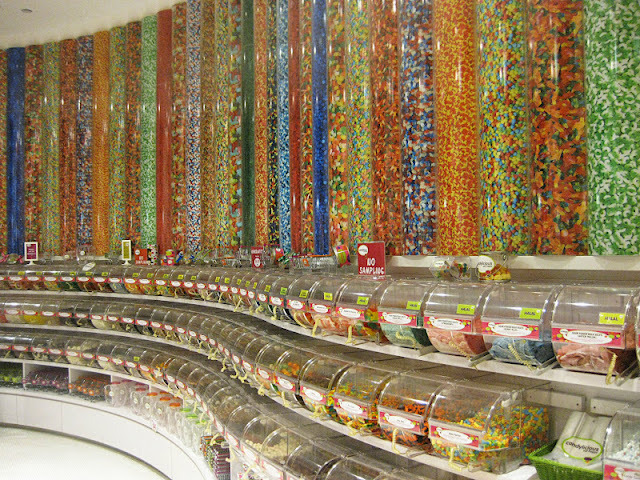 Candylicious claims to be the world's largest candy store. It should be true. I could not imagine any candy store much bigger. 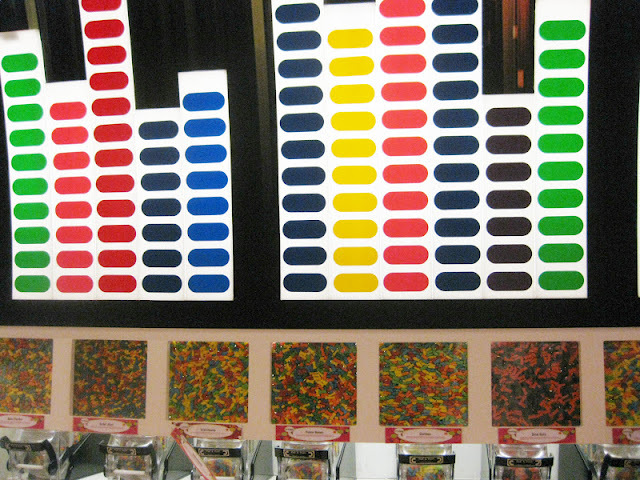 Candylicious is like the real Chocolate Factory of Willy Wonka, all colors, flavors, shapes and levels of sweetness you can imagine in candies can be seen (and tasted) here. There are only 3 Candylicious stores in the world, all of them located in Asia. 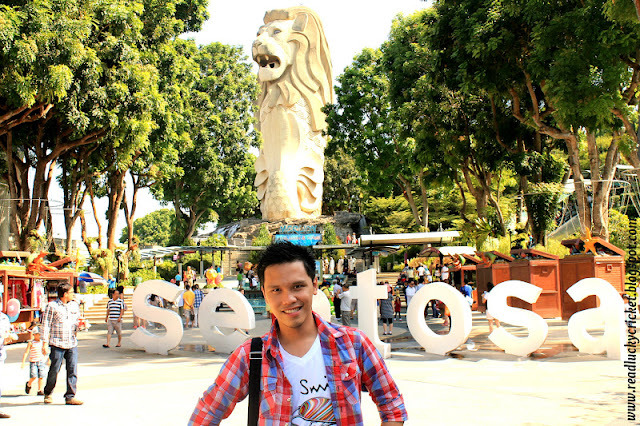 The one in Singapore is located in Resorts World Sentosa. There's one Kuala Lampur, Malaysia and there is another in Dubai Mall, the United Arab Emirates. Enough with words though, below are some delicious shots. As what they say- "Eat Happy!". I mean "Read Happy!". If Juan Tamad was lying down when he waited for that fruit to fall, I was, atleast, standing. If these were real candies, then I don't mind to be the new Juan Tamad. 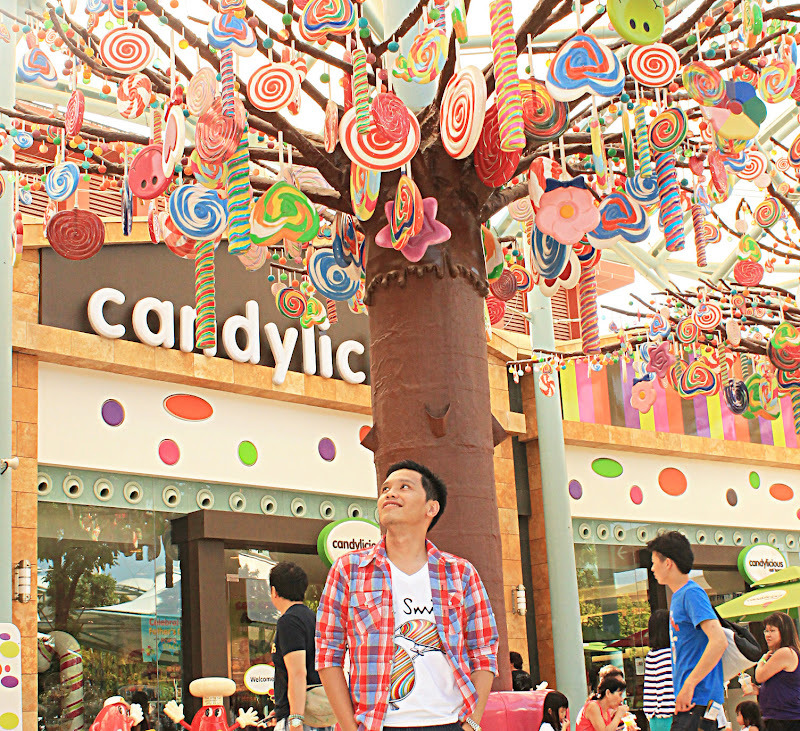 We passed by the seaside sections of Resorts World Sentosa on our way to Candylicious. 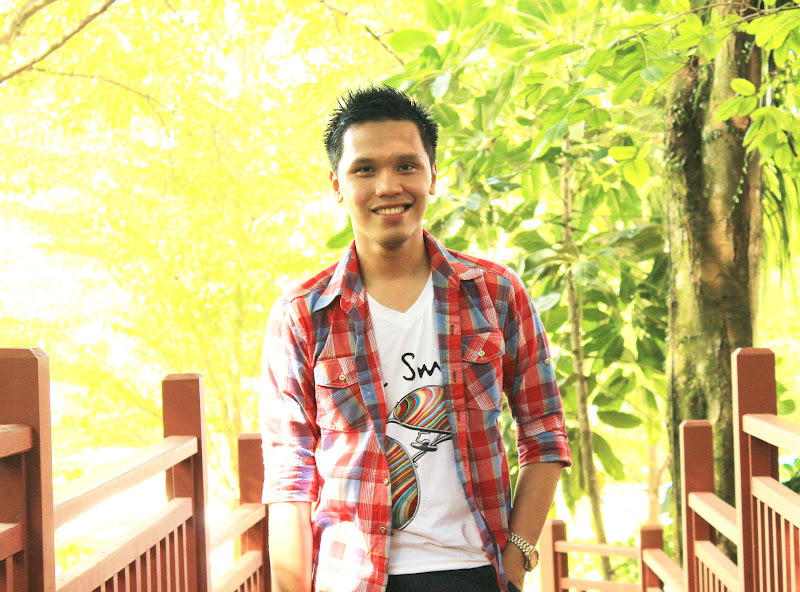 We had this wooden romantic bridge to ourselves so we thought a brief picture-taking would not hurt. of the day. It was too hot that the fountain at the back look so perfect for swimming, if only it is allowed. I prepared for my trip to candy land of course. My theme was everything "orangy". 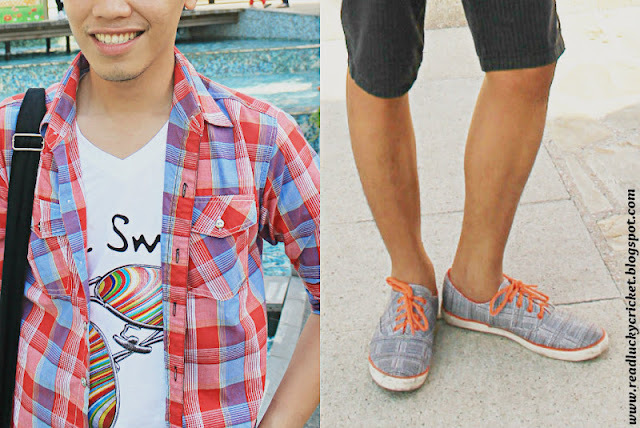 If both were my suitors, guess who will I said "yes" to? 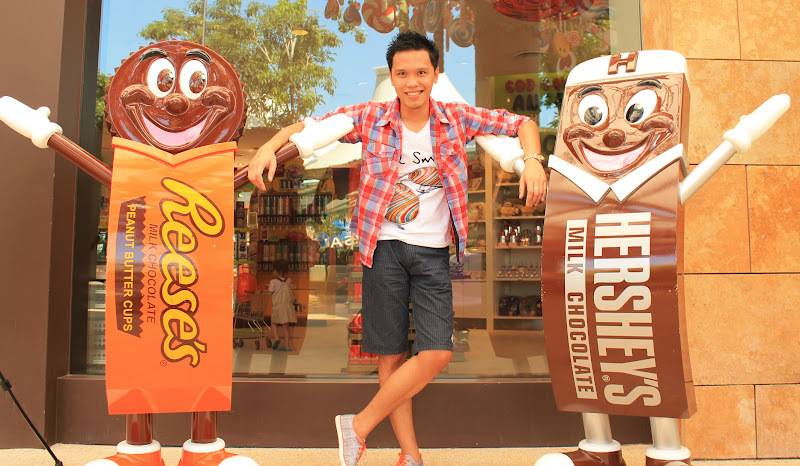 Sorry Hershey's but Reese's wins hands down! All merchandises here are made of recycled materials. And whoever made the copy of the wall slogan is brilliant. 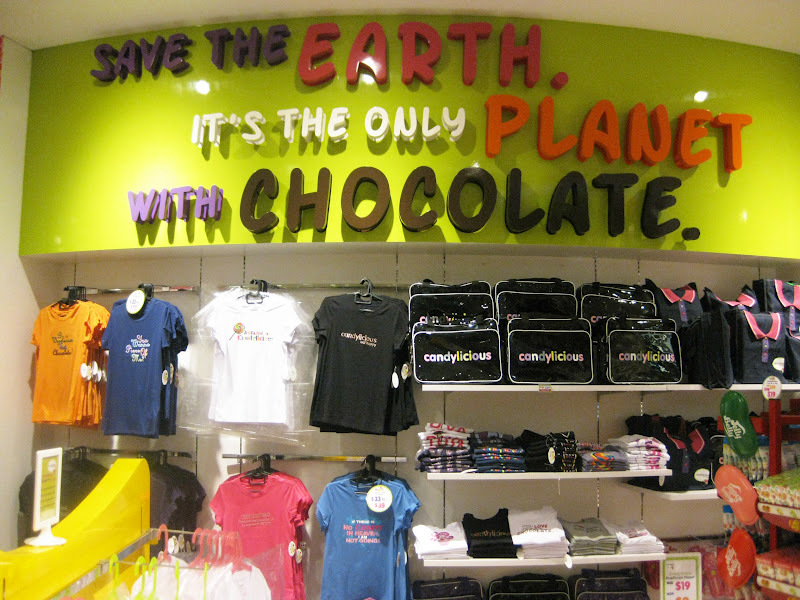 Indeed, the Earth is the only planet with chocolate! I panicked when I saw these! There were just sooo much choices! gums, jelly beans, milk chocolates and so many more! 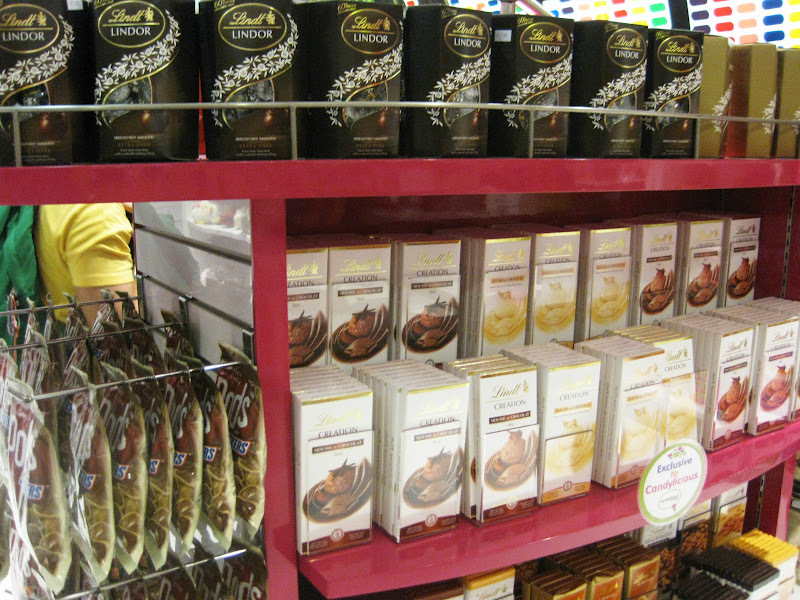 All sorts of chocolates are here! 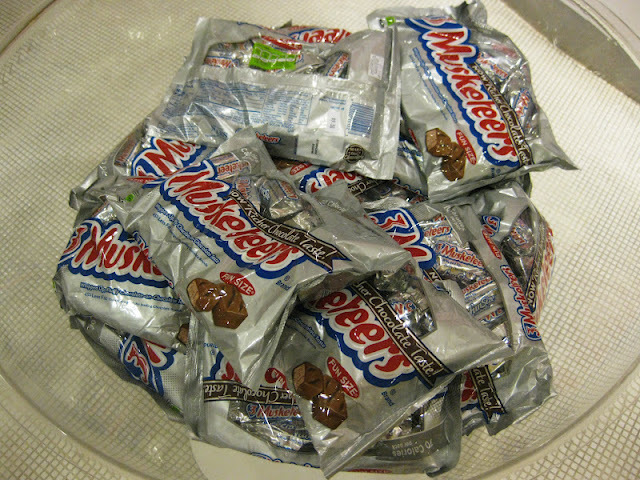 There are about 7 types of nutted chocolates in here too! Me and Lance were running out of time. The store will close in 5 minutes. 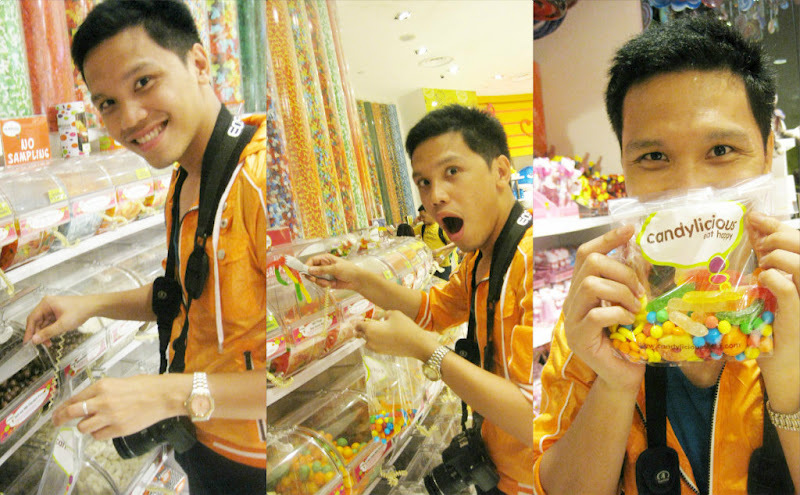 He said, I am allowed to get 1/4 kilos of candies. Of course I exceeded the limit! These are talking stuffed toys. 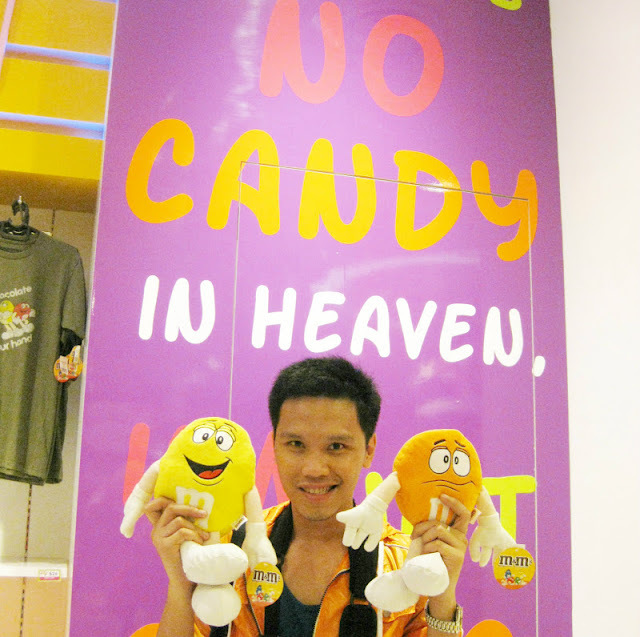 The board at the back says "If there's no chocolate in heaven, I am not going!" 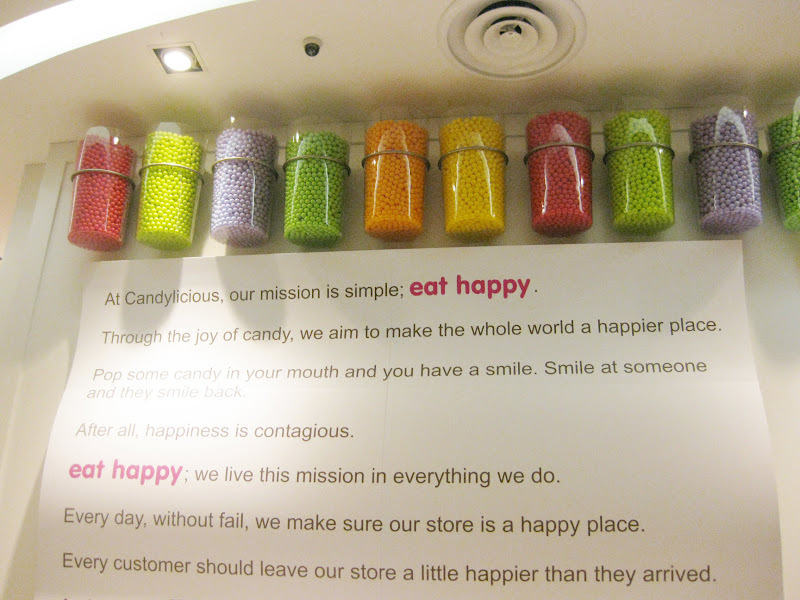 Candylicious's mission: to make all shoppers EAT HAPPY! so we were able to see how they put off the lights. It was spectacular! From the cable car, we used 8 sets of escalators to get to this Merlion Statue. 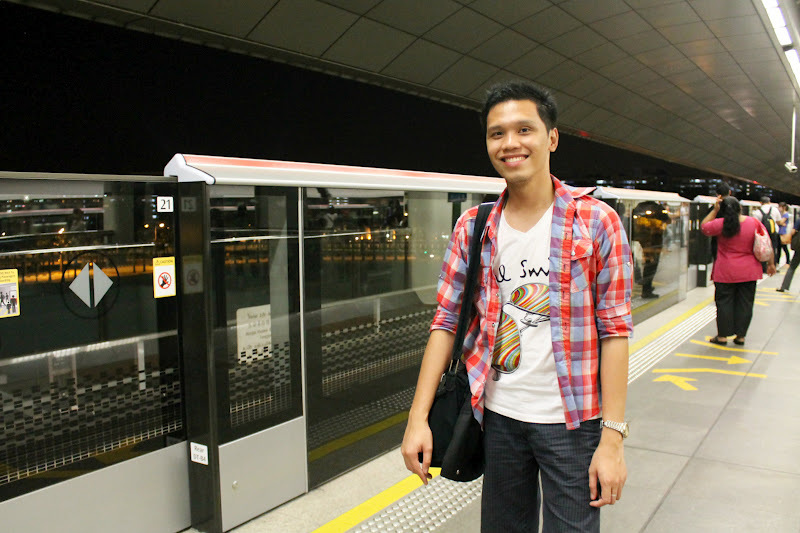 From mainland Singapore, we decided to take the Cable Car to get to Sentosa Island. 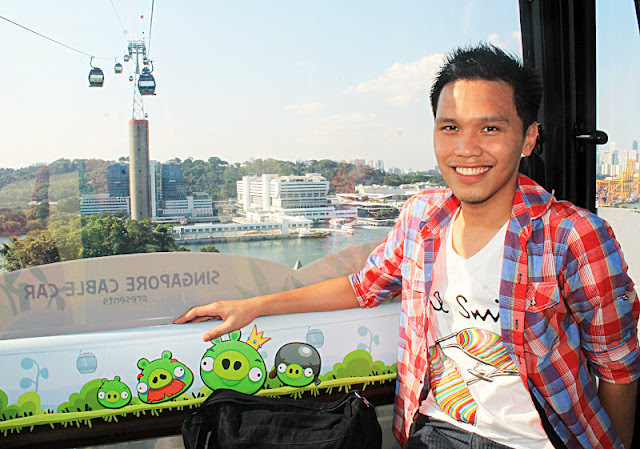 After our splurging at Candylicious, we also used the cable car on our way back. and its cheapest package is priced at $38 or about Php1,254 per person. Our Candylicious adventure also introduced us to two kinds of high-tech transportation. which they also call the MRT.